Shri Arvind Saxena (1978-batch - Indian Postal Service officer) has been appointed as the chairman of the Union Public Service Commission (UPSC). 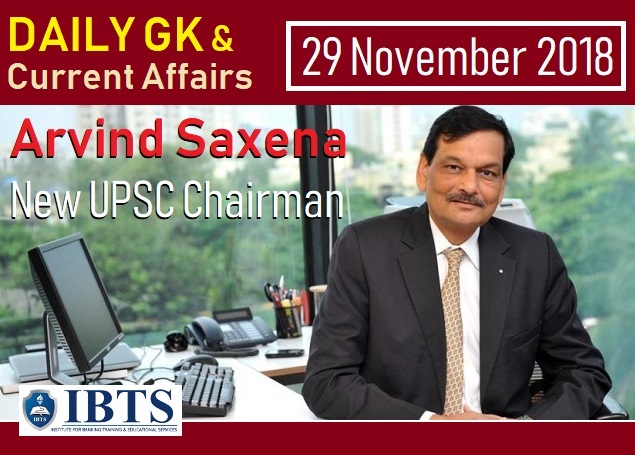 Earlier, Mr. Saxena has been performing duties of the post of acting Chairman, UPSC (Since 20th June 2018). The term of Mr. Saxena appointment will be till 7th August,2020 (attains the age-65 years), or till further orders. Arvind Saxena studied Civil Engineering at the Delhi College of Engineering and did his MTech. in Systems & Management from the Indian Institute of Technology, (IIT) New Delhi in 1978. The UPSC conducts civil services examination annually in three stages (preliminary, main and interview) to select officers for the Indian Administrative Service (IAS), Indian Foreign Service (IFS) and the Indian Police Service (IPS), among others. The Chairman and members of UPSC are appointed and removed by President, as per Article 316 of the constitution. The Group Chairman of Larsen & Toubro Limited (L&T) Shri A.M. Naik has been appointed as the Chairman of National Skill Development Corporation (NSDC) by the Ministry of Skill Development and Entrepreneurship. NSDC has developed a unique model combining skill development with strong industry partnerships. Shri Naik was awarded the Padma Bhushan for his outstanding contribution to the economic growth of the country. The objective of NSDC to promote skill development by catalysing creation of large, quality and for-profit vocational institutions. NSDC is a unique public-private-partnership, working under the aegis of the Ministry of Skill Development & Entrepreneurship. The organisation provides funding to build scalable and profitable vocational training initiatives. Today, Commemoration Day being observed across UAE in recognition of the sacrifice and dedication of Emirati martyrs who have given their lives in the field of civil, military and humanitarian service. It is a day to remember and honour those who gave their lives for their country. According to Crown Prince of Abu Dhabi (Sheikh Mohamed bin Zayed Al Nahyan), Commemoration Day is a national occasion to remember the ultimate sacrifice of the noblest sons of the United Arab Emirates who gave up their lives for the glory of this great nation, to defend its security and interests. The UAE Flag (local time-at 8 AM) will be lowered across the country for three hours followed by one minute of silence and supplication. The Indian Space Research Organisation's (ISRO) reliable workhorse PSLV-C43 rocket successfully lifted off with earth observation satellite HysIS (hyperspectral imaging satellite) along with 30 foreign satellites from the Satish Dhawan Space Centre at Sriharikota in Andhra Prades. The 30 commercial satellites (1 micro and 29 nano) from eight countries, combined weight is 261.5 kg. HysIS can provide hyperspectral imaging capabilities for a variety of purposes, including agriculture and forestry. It carries two payloads one to capture images in the visible near-infrared (VNIR) range of the light spectrum and another in the shortwave infrared (SWIR) range. The satellite will provide Earth observation service till 2023. Donbass’ has won the coveted Golden Peacock Award at the 49th International Film Festival of India (IFFI). The Golden Peacock Award carries a cash prize of Rs 40 lakhs to be shared equally between the Producer and the Director (Sergei Loznitsa), Trophy and the citation. Donbass tells the story of a hybrid war taking place in a region of Eastern Ukraine, involving an open armed conflict alongside killings and robberies perpetrated on a mass scale by separatist gangs. Lijo Jose Pellissery won the Best Director Award for his 2018 film ‘Ee.Ma.Yau’. The Best Actor (Male) Award has gone to Chemban Vinod for his portrayal in Ee.Ma.Yau . The Best Actor (Female) Award has gone to Anastasiia Pustovit for her portrayal of a ‘Larysa’, a teenage girl in the Ukrainian film ‘When the Trees Fall’. Alberto Monteras II receives ‘Best Debut Feature Film of a Director’ for Respeto. The University Grants Commission (UGC) has decided to set up a Consortium of Academic and Research Ethics (CARE) which will prepare a fresh list of credible quality journals in the non-science disciplines. According to commission, the percentage of research articles published in poor quality journals is reported to be high in India which has adversely affected its image. These lists will be critically analysed and curated for quality by a special cell at the entrusted institution using defined criteria. Reference List of Quality Journals’ will be maintained by the CARE and this will be used for all academic purposes. CARE’s focus will be on journals in disciplines such as social sciences, humanities, languages, arts, culture and the Indian knowledge system. The existing UGC-approved list of journals will remain valid till the CARE Reference List of Quality Journals is released. The Union Home Minister Rajnath Singh has launched the India’s first Emergency Response Support System (ERSS) at Mandi, Himachal Pradesh. All emergency numbers, including 100 (for police), 101 (for fire), 102 (for ambulance) and disaster response have been integrated into countrywide one number, 112. The system would identify the location of the person in distress connecting through voice or data and immediate assistance would be provided. Several web-enabled other schemes have also been launched by the Union Government for safety and security of the women. The union Government has allocated RS. 321.69 Crore under Nirbhaya Fund for implementation of ERSS project across the country. Finance Minister Arun Jaitley will present the interim Budget for 2019-20 fiscal on 1st of February next year. The work for preparation of interim Budget has already commenced and is now gaining momentum. For Highlights of India’s Union Budget 2018-19. The Uttarakhand government has decided to rename the Dehradun's Jolly Grant airport after former prime minister Atal Bihari Vajpayee. The proposal to rename the airport was approved by the state cabinet at a meeting chaired by Chief Minister Trivendra Singh Rawat. The cabinet also gave its nod to the setting up of the Uttarakhand State Agency For Public Services to ensure time-bound delivery of services and redressal of complaints. The Prime Minister Narendra Modi arrived in Buenos Aires (Capital of Argentina) to take part in the 13th G-20 summit. The theme of the summit is ‘Building Consensus for a Fair and Sustainable Development’. During the G20 summit, India will highlight the need for reformed multilateralism which reflects the contemporary realities and can effectively strengthen collective action for global good. The Prime Minister will also hold meetings with several world leaders including Chinese President, German Chancellor, Spanish Prime Minister, UN Secretary-General. The first G20 summit took place on in Washington, D.C., United States in South America (14–15 November 2008).